“No painter has ever understood the idyll like him [Corot]." Corot envisioned Campagne Italienne as an intimate corner of nature introduced by a pastoral group in the foreground guarding a herd of sheep in the distance. Corot’s distinctive style is already visible in this painting, with the dramatic play of light and shade modeling both the people and the animals, as well as the use of red for one of the figures’ caps to add volume and contrast to the prevailing green of the landscape. 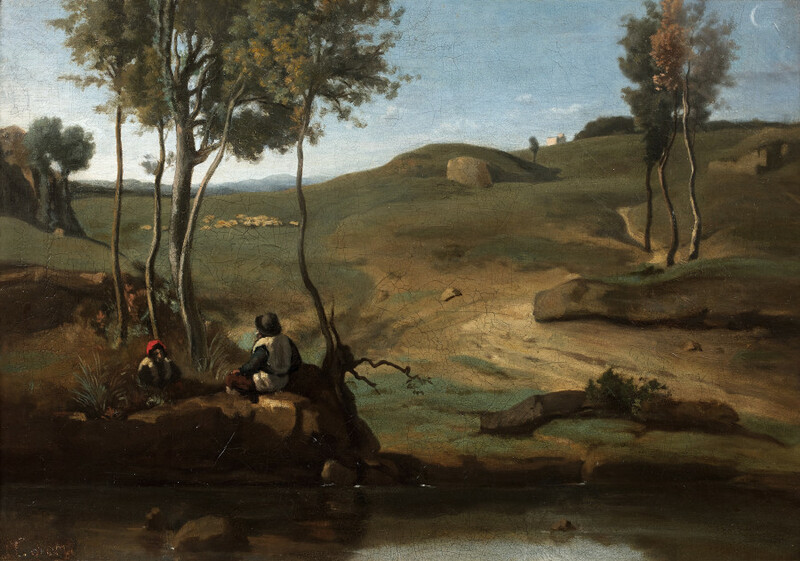 Its format, atmospheric effects and vertical lines created by the trees to convey rhythm, perspective and a sense of depth reveal the strong influence of Claude Lorrain on Corot’s works from this period. We would like to thank Martin Dieterle and Claire Lebeau for kindly confirming the authenticity of this painting.